The report, ordered by MacKenzie King at the end of the Second World War, made a distinct mark on the National Capital Region. The report was used as the model for the development of the National Capital Region for more than 50 years. 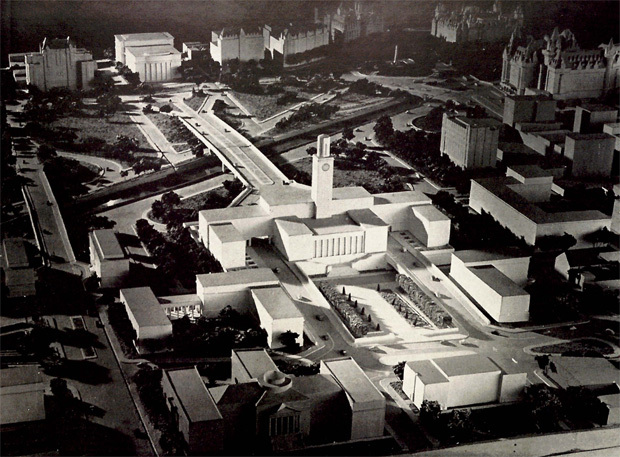 Strongly inspired by the modernist movement, the plan was designed to make Ottawa a city worthy of the “future greatness of Canada”. Its implementation was to drive higher levels of progress and correct problems that were “compromising natural assets”, such as too much urban density(! ), an overly visible railway and the presence of industrial area in the core. 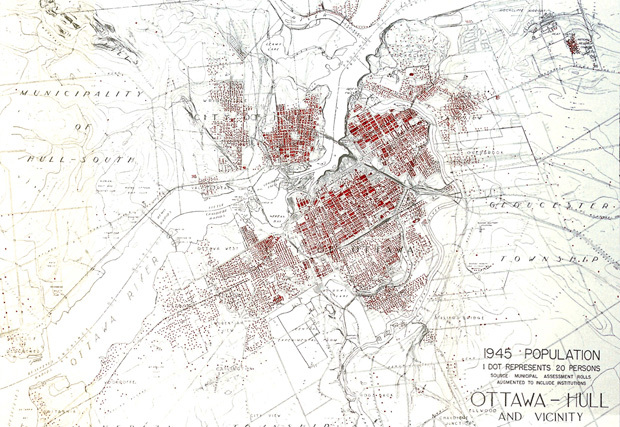 Density Map of Ottawa-Gatineau in 1950. Gréber Plan (Plan for the National Capital - General Report). With the benefit of hindsight, it is clear that certain elements at the heart of the Greber Plan caused more harm than good. A good example is the demolition of Lebreton flats, the widening of roads to make them major transportation routes, such as Saint Patrick in Lowertown and King Edward, as well as the decentralization of federal government buildings. On the other hand, the Greenbelt and Gatineau Park, are examples of positive elements that have been beneficial for residents of Ottawa and Gatineau. In 1937, Jacques Gréber received his first mandate from Prime Minister MacKenzie King- to determine the location of a commemorative monument for the First World War. Greber, who favoured Major Hill’s Park, was later convinced that Connaught Square should be home to the new monument, which was so prized in the eyes of MacKenzie King. The “gaping hole” in the middle of downtown caused by the Russell House fires (1928) and City Hall (1931) became instantly four times bigger as the exit of Knox church, the old post office (as well as a number of other buildings) were sealed: they had to leave in order to prevent shadowing on the magnificent monument. 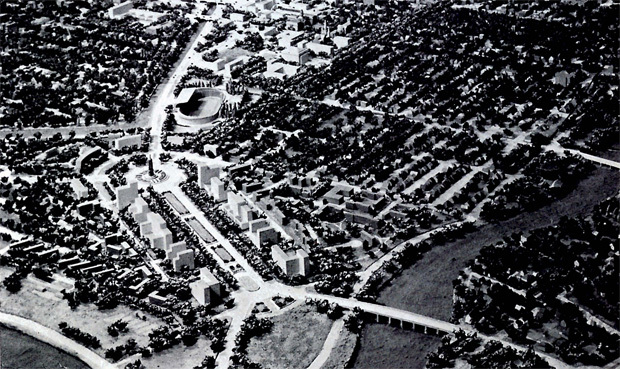 In 1938, Gréber was mandated to develop, what would become 12 years later, the famous Plan Gréber. The Second World War put a break on its development, but in 1945, MacKenzie King once again contacted Gréber in order to move forward on the plan and lay the plan which was so important to the Prime Minister. At the time, the federal government was toying with the idea of creating a federal district, in the same image as Washington DC. By his own admission, Gréber’s plan recommandations were going to strictly be restricted to the urban problems that constituted the heart of his expertise and would not touch the political side related to the potential federal district. Since Jacques Gréber never came to Ottawa, Public Works Canada took the responsibility to photograph almost all of the intersections in downtown Ottawa in order to give Gréber a sense of the atmosphere and feel of Ottawa. In fact, it is for this reason that a large part of the photos on Ottawa Past and Present are from 1938. Ironically, MacKenzie King never saw the report itself since he died two years before the report was finally submitted. Modernism is a significant element of the Greber Report. Written a few years after the development of the Athens Charter, that was commissioned by automobile manufacturers at the time, Greber was inspired by a number of concepts that were part of a “functioning city”, of which the centrality of the automobile, the greening of urban areas and the segregation of areas based on their usage. Literature review: state of environments, climate, vegetation, hydrography, etc. Despite the fact that the report reveals the rather industrial (lumber) origins of the cities of Ottawa and Hull, these industries appear to be principle targets of the report. According to Greber, it is unimaginable that the capital of a country with such aspirations could have, least in its centre, an working industrial sector/area. Looking towards the future, Ottawa should personify a strong federal state as well as strong institutions that would leave little space for other types of employment/other sectors. Industries already in place should therefore be moved. It is principally for this reason that Ottawa has almost no industrial heritage buildings unlike many other North America cities. In terms of transportation, the automobile is really a central priority. The report states: “It is evident that the width and transverse profile of a public highway must be studied in relation to traffic.” (P.176) The proposal was, amongst other changes, enlarging a number of principle arteries as a preventative measure (Waller, King Edward, York, Laurier, etc). Still according to the report, this change would financed itself given the increase in assessed value of property along the roads to be enlarged. Forty years later, we can see that the opposite happened and that the value of houses along King Edward declined. After all, who wants to live directly on an 8 lane boulevard? Road network proposed for the Ottawa-Gatineau region. Gréber Plan (Plan for the National Capital - General Report). The report is meant to also be extremely complaisant because it qualifies buildings to be demolished as old or not important in order to satisfy the car-centric approach of Greber. Remembering that the Roxborough apartments and Bates apartments as well as the old Post Office were sacrificed for this reason. The replacement of the Canadian national railways that crossed from the east to west of the city should be replaced a new boulevard. The city was constrained in constructing the highway because provincial funding was conditional on the construction of this type of infrastructure. The report also proposed to reduce as much as possible street parking so that “parked cars don’t prevent the flow of traffic”. It is for this reason that it was suggested to increase parking set back from the street. In order to accomplish this, it was necessary to take advantage of (relief) and construct the “most possible” leveled garages (need better translation). Once again, the report made a false link as it was proven that off street parking is an obstacle in obtaining vibrant and sustainable communities. Regarding urban planning, Gréber proposes the implementation of a green belt which would prohibit tentacular and linear extensions and therefore curb undersirable development. This idea is fundamentally good, but became tedious to implement since former satellite cities (Orleans, Kanata and Barrhaven) would competition the main city to attract new residents and industries. The results would have certainly be different if the greenbelt implementation would be have done alongside discussions on agglomeration of neighboring municipalities. Modernism is omnipresent in the analyses and findings as it states that “it is abnormal, if not absurd, to erect multiple dwelling structures, 4, 5 or 6 storeys and even more in height, bordering on streets, often at their intersections, and lacking open space, while adjoining individual houses are setback from the streets within ample garden space” (p. 226). This statement, however, makes little sense as its application would only decrease the high density that is created by those apartment/multi-dwelling buildings and as well increases the distance residents need to travel to reach basic services. The new City Hall proposed close to the Confederation Park. Gréber Plan (Plan for the National Capital - General Report). Greber also invokes disorder in which cities develop without plans and control; as if organic growth resulting from real needs only produces chaos and that the only way for growth to happen was through strict and rigid rules. The report follows with a series of recommendations on the areas to prioritize for the construction of various federal buildings. For example, the Ministry of Veteran Affairs should be constructed on two blocks between Kent and Bay on Wellington and the National Printing Bureau should be moved to the Quebec side. The absence of a national theatre is mentioned. The report recommends the construction of a theatre of 2500 seats on Elgin Street, where the current National Arts Centre (NAC) is located. In terms of public transportation, the report suggests that the tramway lines are removed, which according to Greber, do nothing but slow traffic and worsen congestion. It was trending back then, the report went like this (again, in the greatest indulgences ): “We are confident that all tramway lines will ultimately disappear from the urban scene, as is the case in most modern cities.” We would like to point out that Toronto still has streetcars running in its core. We will conclude by stating that the report was recommending the establishment of a green space network which should have bordered the different villages and communities. 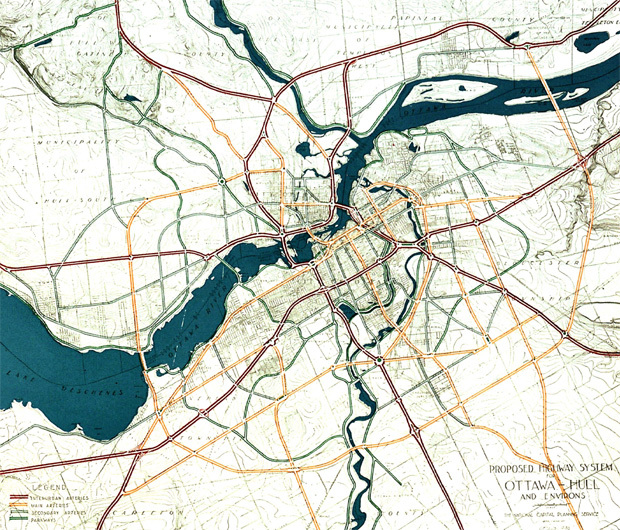 The Ottawa River and the Rideau Canal were the ideal place to lay down a network of parkways that would make the commute for the new suburbanites so pleasant. The NCC is currently undertaking a massive study to review land use specifically of its parkway network, which is somewhat a disavowal of Gréber’s vision. 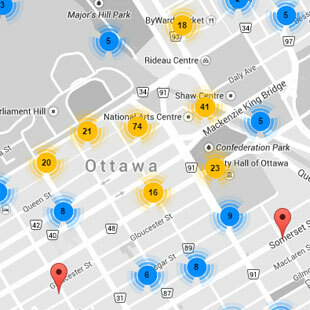 Lees Area in Ottawa. Gréber Plan (Plan for the National Capital - General Report). The plan was written in the worst of time: the automobile was a sacro-saint sign of progress and the federal government had money to implement those costly urban reforms. We don’t believe Gréber himself is to be blamed for its plan: most likely someone else would have come up with a similar plan. The Greber Plan definitely left deep scar in the National Capital Region, unlike the other preceeding plans (Holt, Cauchon) which were never really implemented for good reasons at the time. We wish the Greber Plan would have had the same outcome: that it never made it to the implementation phase. After all, Jacques Greber made a substantial mistake when he estimated the population of Ottawa to be around 400,000 people in 2000. Could it be possible that he was also mistaken on several other fronts?